Martha Grover is a Professor in the School of Chemical & Biomolecular Engineering at Georgia Tech. She earned her BS in Mechanical Engineering from the University of Illinois, Urbana-Champaign, and her MS and PhD in Mechanical Engineering from Caltech. She joined Georgia Tech as an Assistant Professor in 2003, and received an NSF CAREER award in 2004. 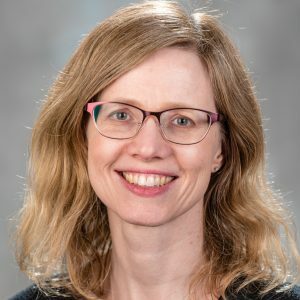 In 2011 she received the Outstanding Young Researcher Award from the Computing and Systems Technology Division of AIChE, and in 2018 she received the Himmelblau Award for Innovations in Computer-Based Chemical Engineering Education. Her research program is dedicated to understanding, modeling, and engineering the self-assembly of atoms and small molecules to create larger scale structures and complex functionality. Her approach draws on process systems engineering, combining modeling and experiments in applications dominated by kinetics, including surface deposition, crystal growth, polymer reaction engineering, and colloidal assembly. She is a member of the NSF/NASA Center for Chemical Evolution, and Georgia Tech’s Decision and Control Laboratory. Kocevska, S.; Grover, M. A.; Rousseau, R. W. (2019). “Monitoring the composition of low-activity nuclear waste using in-situ measurements.” Proceedings of the Annual Waste Management Conference, March 2019, Phoenix, AZ, accepted.